Trending at $14.98Trending price is based on prices over last 90 days. Trending at $26.40Trending price is based on prices over last 90 days. Premium Classixxs Opel GT Red Color in 1/12 Scale New Release! Minichamps 1:43 Opel GT 1965 Pre-Production red L.E. 250 pcs. 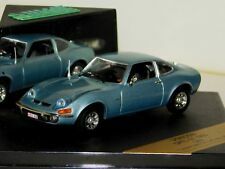 Premium Classixxs 1971/1973 Opel GT/J Yellow 1/12 Scale. New Release! Solido 1:43 OPEL GT E RALLYE MONTE CARLO 1978 Model Car + Decalsheet #70 MIB`78! This page was last updated: 25-Apr 10:08. Number of bids and bid amounts may be slightly out of date. See each listing for international shipping options and costs.